One of the major benefits of using a router table that most users realize only after they start using one is the high precision to be had from using a mounted router in a table setup, as opposed to a handheld router. While the actual precision of any machine depends on one’s knowledge of how to use a router table, it is true that unlike the handheld router, the cutting bit of the router table is fixed and allows the wood to pass along without itself being moved in any direction. Such precision, furthermore, also allows for users to apply substantial pressure on the wood in situations where the vibration of the machine is causing the piece to shake and slide on the table. Applying similar pressure on either the wood or the router in a handheld router setup would inevitably result in the router knocked off course and this, in turn, resulting in a poor and irregular cut. Precision, however, has yet another benefit – speed. Since the user doesn’t have to worry about the router going off course, he can move the piece of wood at a rapid pace and still obtain a decent cut. This can improve the output of the woodworker substantially. Handheld routers are primarily meant for cutting in straight lines or in geometric patterns. Hence, irregular pieces of wood or those involving complex patterns would require a fixed router bit that is capable of allowing the user to manoeuvre the wood to his liking without having to adjust the router in any way. Needless to say, the router table is the only way to achieve such a feat. Indeed, many of the router tables come with special slots for pins to act as router markers for the pieces of wood, while a good number of those learning how to build a router table attach specific pins and wood pieces to customize the table surface according to the shapes of the wood pieces involved. As a corollary, convenient handling of complex inlay work is also included among the benefits of using a router table. Inlay work, or cutting patterns within the wood piece (as opposed to along one edge) is a specialty of the plunge router. While plunge routers can be operated without the use of router tables, they most often require frames that are attached to router tables for stability and precision, thus making the router table a vital component of any project involving inlay work. It is commonly assumed that the depth of the cut can be customized more easily if the router is handheld and not bogged down by a table. This may be true for simple cuts that allow for quick adjustment, provided the person using the router is highly experienced and knows the pros and cons of using say a ¼” bit as opposed to a ½” bit. In more complex situations, handling the handheld router again and again can become a difficult chore, even as the lack of precision causes the different bit depths to overlap and cause the edges to become jagged and uneven at places. Router tables on the other hand, have a fixed, easily accessible bit assembly that lends itself to rapid modification. This makes choosing and modifying the depth of the cut easier, even for users who have been tasked with complex multi-depth cuts and/or have little experience in woodworking. Further, since all cuts have improved precision, the end result of a multi-depth cut is a piece of wood with well-defined and smooth edges. As we have shown while explaining how to maintain a router table, the maintenance procedures for the router table are among the simplest in the world of woodworking benches. Indeed, even router maintenance is made easier because the sawdust that would otherwise end up getting into the niches of the router is left on the table and only a small portion moves below the table and onto the router. This is not to say that the router in a router table does not require maintenance, and it is often thought that because the router has to be removed from the mount, the process would be nothing short of tedious. In reality, a good part of the dust can be removed from the router by simply vacuuming the bit assembly (with bit itself removed) from the top of the table. This, coupled with the fact that actual removal and reattachment of the router is also simple should such procedures be required, make thorough router maintenance extremely simple. Finally, it is well known that the stationary cutting bits are far safer than moving ones, regardless of the safety mechanisms of the cutting machine itself. This dictum applies especially to router tables because cutting with a handheld router requires one to apply pressure on the router and this can easily cause a mishap if adequate care is not taken. With a router table however, the danger of an exposed bit is never present because it is always sandwiched between the fence and the piece being cut. While the benefits of using a router table may be many, it is important to remember that they can only be enjoyed through proper preparation and operation. For instance, if adequate care is not taken to avoid the sawdust and occasional splinter coming out the cutting bit, eye damage may occur despite the router table and the router itself having the best safety mechanisms possible. 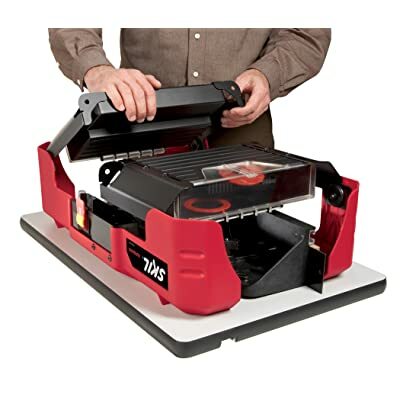 Further, as our router table reviews would show, the mode of operation and exact safety/maintenance specifics would vary and if these aren’t followed properly, damage and malfunction may occur. All considered however, the fact that features like easy mounting and the easily adjustable fixed router assembly have become common to virtually all good router tables means that the benefits outlined above would be applicable, partly if not wholly, to any good router table you purchase using our buying guides.